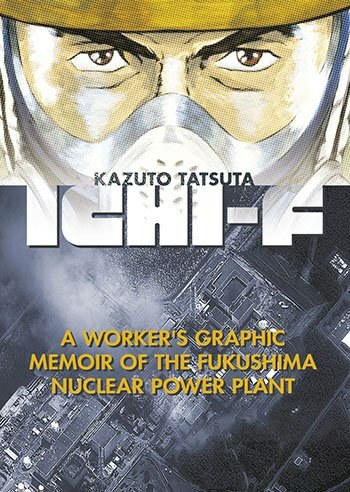 Ichi-F is rich in detail and strikingly perceptive in analysis, and yet it oddly supports the nuclear industry even as the radiation continues to take its toll. 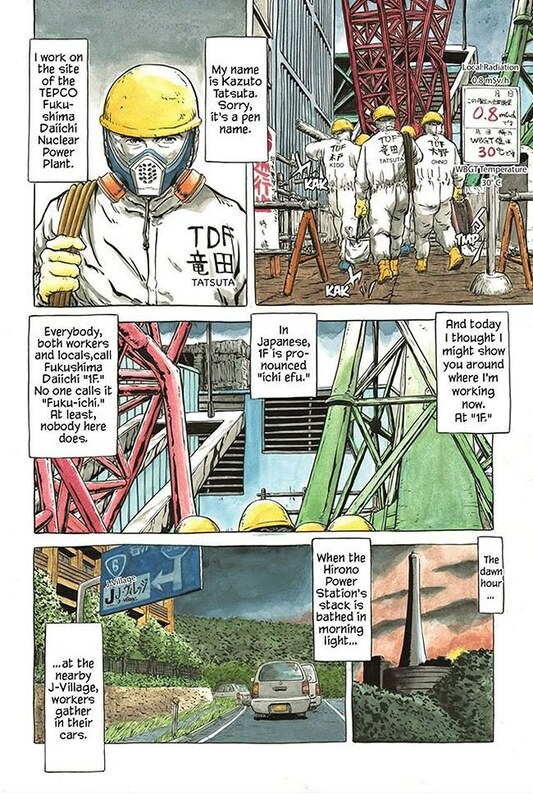 Kazuto Tatsuta’s account of his work experience at the massive clean-up project at Fukushima’s Daiichi nuclear plant is remarkable on many levels. The plant -- known as Ichi-F for short -- was the one which experienced three nuclear meltdowns in the wake of the destructive earthquake and tsunami of 11 March 2011. Since that disaster, a large-scale clean-up effort at the nuclear plant has been underway, simultaneous with broader reclamation and recovery efforts in the surrounding regions that were devastated by the triple disaster. Tatsuta’s (the name is a pseudonym) true identity remains unknown, but he claims to have been a middle-aged temp worker with a bit of manga illustration background who got himself hired by a subcontractor doing clean-up work at Ichi-F. After he completed his initial work assignment, he returned to Tokyo and began producing manga accounts of the recovery effort. The manga were a smash hit, rapidly consumed by a public still riveted by the disaster and starved for accurate information about what was going on in the still tightly-controlled recovery zone. Between government propaganda on the one hand and activist/media sensationalism on the other, Tatsuta’s manga offered a refreshingly different take on the situation at Ichi-F. He largely avoids politics, simply depicting the day-to-day experience of workers in the recovery effort. Tatsuta’s work -- finally compiled and translated into English -- is hard to categorize as a manga. It’s deeply technical, offering layout sketches of the site, detailed explanations of the nature of the work and equipment that’s used. It’s also deeply perceptive in its analysis of the work relationships at the site; almost the equivalent of sociological fieldwork. It’s sometimes been categorized as a ‘slice of life’ manga; that manga genre which concentrates not on literary technique or telling an exciting story, but on depicting some aspect of real life experience for the elucidation and empathy of readers. But it’s more than that. Tatsuta’s work described itself as a ‘labour diary’ in the original Japanese version; the English translation calls it “a worker’s graphic memoir”. The terms ‘labour’ and ‘worker’ are important here: the work verges on offering a new genre, a sort of proletarian or working-class manga. This is reflected in Tatsuta’s apparent determination to identify himself and his colleagues as workers. It’s an identity he aims at in opposition to those who would label them either as heroes or as gullible and exploited; as villains or victims. He struggles to assign his colleagues a sense of agency in their work. They’re not heroes, but they’re not slaves either. They’re everyday guys (he depicts an almost exclusively male recovery project) going about their jobs with dignity, pride, and an essential sense of humanity. They care about doing a good job (a uniquely Japanese fastidiousness evident in their focused teamwork), yet eagerly grab the opportunity for a casual nap behind a radiation shield whenever they can. There is a proud albeit masculinist tradition in Japan of the ‘day labourer’ -- those workers who showed up at big city hiring sites seeking manual labour jobs in the pre- and post-WWII era. A tradition nearing extinction in the ‘90s, it was reborn in the age of the Internet, which managed to precaritize employment not just in manual labour but in all fields of endeavor. Cell phones and Internet terminals became the new hiring site, and precarious labour extended to even skilled and professional jobs. The nuclear clean-up work Tatsuta engaged in is the direct descendant of this lineage of precarious employment. Unfortunately, he doesn’t dwell on the fact, instead chosing to normalize and shrug off the broader social implications of his precarious livelihood as an unemployed man in his late 40s. Tatsuta has an eye for the every day, and the importance it plays in humanizing his subjects -- the complexity of needing to use the toilet while wearing a radiation suit, or the difficulty of organizing bath-time in an overpopulated rental unit housing a dozen workers. There’s the beauty of a sunrise breaking over the horizon as they come off a late-night work shift, and the awkwardness of his boss prepping him what to say during a ‘surprise’ safety inspection to come later that day. 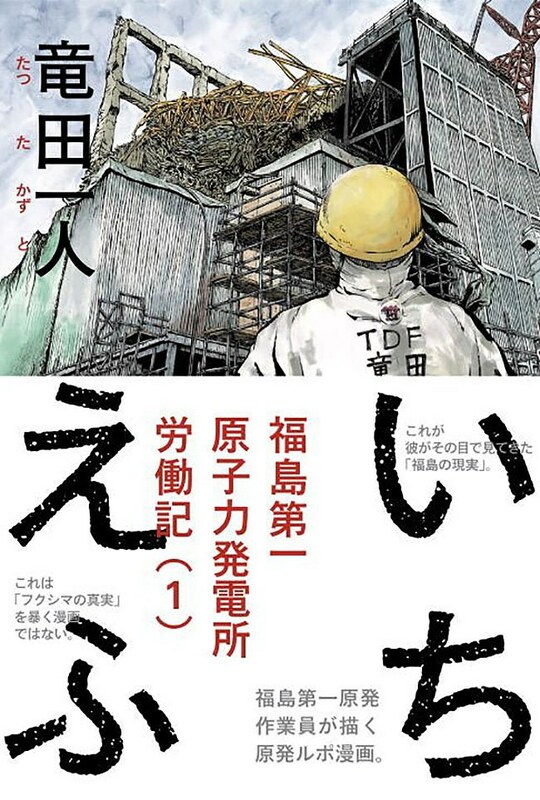 His account would indeed be a remarkably working-class, proletarian manga, at least insofar as it depicts in profound detail the experience of working-class life among the precariously employed at the nuclear plant, except for the fact that it lacks any deep political analysis. His structural analysis is first-rate; he breaks down in precise detail the complex work relationships at the plant. But he offers little in the way of judgment, and what little opinion he does offer is startlingly ambivalent. Yes, they’re precariously employed, even exploited in some ways, but he shrugs it off -- they’re everyday guys, and that’s the way life goes. His commentary suggests this lack of judgment is the unique strength of his approach in this manga, but it can equally be seen as irresponsible prevarication. He argues that what he presents is the honest portrayal of workers’ attitudes, apparently trying to forestall his critics. But a shrug in the face of precarious employment is hard to accept as honest and down-to-earth; it reeks of political immaturity. He also offers a broader progress narrative and refreshing though this may be in the context of Fukushima, the world has rightly become cynical of progress narratives. When I started work, there was a police checkpoint at the intersection next to J-Village... Just about anything within 20km of Ichi-F was an off-limits protected zone. As the zone shrinks, the evacuation orders are slowly removed, but by bit…The lots for sale, which I showed you before, now feature new buildings under construction. You still see those black bags of contaminated dirt and protective green sheets, but there are also more and more fields and paddies replanted Rather than giving credence to the boilerplate “No path to the future,” “sluggish recovery” narratives, why not lend an eye to those areas which are recovering, slowly but surely?.. Nothing will happen that can be worse than what already happened. Well, that’s the big question now, isn’t it? Tatsuta’s account may not be inherently critical of the nuclear industry, at least not on the basis of health and safety -- he goes to great length to argue that radiation and its hazards are as controllable as any workplace hazard, and that the clean-up and recovery effort is actually proceeding quite well -- but his narrative offers indirect yet profound criticism of the industry from a labour rights perspective. He illustrates a complex and privatized network of contractors and subcontractors engaged in the clean-up effort, which his work reveals as inefficient, greedy and deceptive (if not outright dishonest). This is most clearly demonstrated in his efforts to obtain work in Fukushima. Back in Tokyo, he initially applies to several contractors, and despite offers of work -- some of which sound so solid that he quits part-time jobs in preparation for his departure to Fukushima -- only to be left hanging, or to discover that the companies have gone out of business and disappeared. When he finally does receive an offer that takes him to Fukushima, he and his co-applicants are left hanging for weeks while they wait for the subcontractor to be offered a gig. During this time, they are accumulating debt for their company-provided food and lodgings and other obligatory expenses that will be deducted from their pay, if they ever get any. They are eventually transferred to other lower-paying jobs as an interim measure while the company awaits a hopeful contract for nuclear or tsunami cleanup. Meanwhile, their lodgings are inadequate as well: ten or more men crammed into a single family living space, with a single bathroom. Eventually, the subcontractor gets a contract, and Tatsuta gets to do the sort of work he came to do. But the shenanigans he experiences while waiting for that work reveals the inefficient and most likely corrupt sort of schemes that are the inevitable byproduct of such a convoluted and privatized system. Tatsuta may scoff at the health risks of the nuclear industry, but he’s quite open about the shortcomings of the industry from a labour rights perspective. What is that supposed to mean? How is the reader supposed to interpret his take? Is he so unaware that he doesn’t realize that he’s just described an incredibly inefficient, wasteful and corrupt system, with brilliant clarity? Does he simply not care? Are his final comments to be taken as a form of defeatism verging on nihilistic insouciance? Is he simply a prodigal yet immature analyst? Or on the other hand, is he hiding his true colours, pretending to be blasé or even on the side of the nuclear industry subcontractors, while laying out the system in damning enough detail so as to allow readers to draw their own conclusions? It’s hard to tell how Tatsuta situates himself in this work. On the surface, he situates himself in the working-class, but in an almost over-the-top way. He doesn’t just work at Ichi-F for a job; he actually comes to love the work. Despite the fact that it’s hot, physically grueling and demanding precarious shift-work for low pay, he seems to become addicted to it. He earnestly misses it when he’s back in Tokyo working on his comics, and eagerly jumps at any opportunity to return. Is this macho bravado? Would he, for that matter, be as gleeful at the prospect of being recalled to work at the site if he didn’t have a ready exit visa in hand whenever he wanted, in the form of his alter-ego as a rising manga star? It is, of course, hard to say. But what is true is that the precarity of the men’s labour is ultimately sacrificed in the narrative, subsumed to Tatsuta’s effort to demonstrate the casual, if occasionally courageous, indifference of Ichi-F workers to their unusual work environment. Radiation exposure is reduced to numbers on a scale, and the men’s primary concern becomes how to reduce their daily exposure not so much for health reasons but rather so that they can extend their paid work at the site. Employees are only permitted to accumulate a certain amount of radiation exposure each year, and once they reach their annual limit they’re laid off and sent home to wait for the chance of a gig the following year, once their exposure levels have dissipated and reset. The narrative is profoundly successful at challenging broad-based fears of radiation exposure: the workers toil away, quite confident that kept within reasonable levels radiation exposure is nothing to worry about. Be that as it may, a job that lays off workers in order to preserve their health from the daily radiation they experience is a form of precarious and exploitative labour regardless of whether the radiation is dangerous or not. Tatsuta strikes back at his critics, depicting his working-class comrades as everyday guys doing their best under difficult circumstances: hard-working, stoic, dedicated and determined to persevere. He resists efforts of journalists and activists to depict the work as unduly dangerous, or evil, or complicit in hiding truths from the public. They’re no different from any other group of hard-working labourers, he argues. But in his efforts to demonstrate this, Tatsuta’s narrative achieves the dubious success of glamourizing and normalizing precarious labour. Tatsuta has kept his identity hidden, he says, because he continues to seek work at Ichi-F (at the same time as he cultivates careers in manga and music), and he doesn’t want to compromise his company and colleagues. He implies that he wouldn’t be hired for any more gigs at Ichi-F if it became known who he was. But really, it’s hard to say whether that’s the case. Regardless of his intentions -- which he professes to be neutral; neither to promote or oppose the nuclear industry but simply to depict his first-hand experience as a worker -- the fact is that his depiction does a tremendous service for the industry by portraying the experience and hazards of life at a recovering nuclear plant as normalized, everyday, routine and controllably safe (so long as one forgets that the reason they’re working there is that the plant experienced three unexpected meltdowns in the first place). This is quite a boon for the nuclear industry, whether he intends it as such or not. His analysis of work relationships are less positive, but he accompanies them with a cheery slap on the back: “the folks working there are all just ordinary old guys” and “you can say that about almost any place in Japan”. The result is a worker’s manga that’s rich in detail, strikingly perceptive in analysis, and yet winds up siding with the bosses. 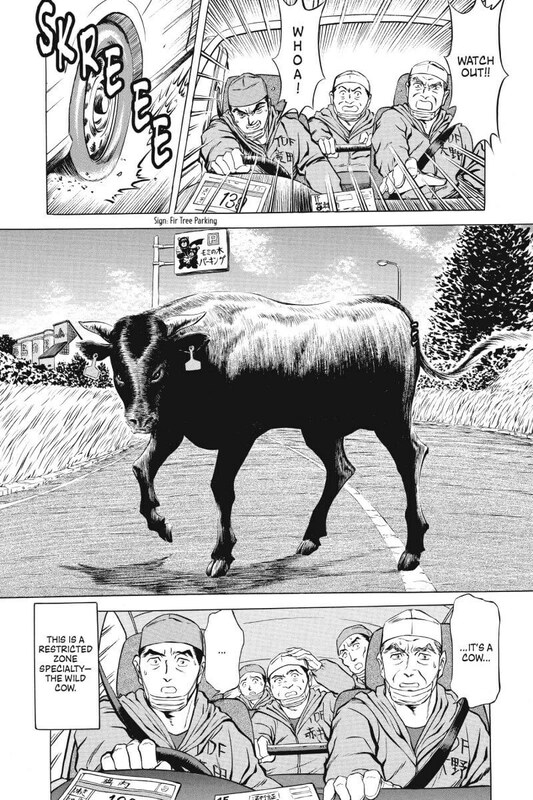 Not quite the proletarian manga, but a remarkable demonstration of what working-class manga could be. And a thoroughly fascinating read, either way.